Giving character to an outdoor space is easy with a final touch that brings all the usefulness of a functional piece together with decorative elements. That final touch is a hanging solar light. Solar lights in general are the epitome of functionality. That is because not only do they come in every design of light out there, but they also eliminate the need for wires, plugs and even to pay for electricity. They rely instead on solar-charged batteries. They also come in a variety of designs. So whether your preference is a lantern, a string of lights or something else, there is an option out there to meet your needs. Dimensions: 5.5 in. x 11.5 in. Our overall favorite hanging solar light is the Outdoor Black Solar Candle Lantern. It’s flickering but flameless. That makes for a safe, efficient combination that gives all of the romantic atmosphere that you want from a lantern, without the need for a candle or for wires to power the electric replacement. This particular lantern is large and looks authentic. Unless you get really close, you might not even notice it’s a solar-powered candle, not a real one. It comes in a two-pack and is made out of durable outdoor weatherproof materials, meaning that it will stand up to the test even if you leave it outside any time of the year. What we love the most, though, is that this solar hanging light performs well in all categories, exactly how you’d expect it to. With a full charge it can last hours. It’s just as bright or brighter than a real candle would be. It looks just like a real candle. You can expect it to hold up for a long time. You won’t even have to do anything to keep it up. Reviewers love this lantern, too. They say that they work exactly as you would want them to – the more sun, the longer they stay on. If they get maximum sun, they can stay on almost all night. The style of the lantern also impressed reviewers. They were pleased with how the lantern looks as well as the soft, amber light that the flickering “candle” gives off. In addition to the run time and style, reviewers also noted that this lantern does well in all sorts of weather conditions. Even in rain and snow, given proper sunlight between, they will come on, and they don’t seem to be negatively affected by getting hit by rain or snow. The Outdoor Black Solar Candle Lantern works in a similar way to most outdoor solar lights. It has an on/off switch. Once activated, it sets the lights to an automatic on/off mode. That turns them on when it senses darkness and turns it off when the sun comes up in the morning (or when the light runs out of battery). One thing to keep in mind with regard to this light is that although it has a reliable run time, the manufacturer notes that it will only run up to 8 hours. (This would be with the full charge of the battery.) So, although the run time is reliable, it isn’t the longest run time that a solar light can offer. Similarly, although we love the candlelight glow, this lantern isn’t the brightest. So that’s something else to keep in mind when choosing the best hanging solar light for you. The brightness is perfect for ambient lighting. However, it may not the best for lighting up a pathway, for instance. 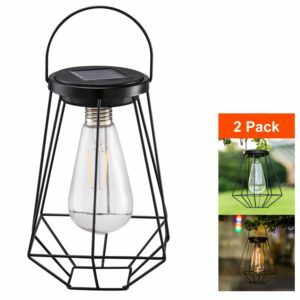 All of that said, the Outdoor Black Solar Candle Lantern takes the top spot in our list because of its reliability combined with its durability that makes for a perfect hanging solar light. We’re fans of the stylish design of this lamp and the artificial candle that makes this lantern no-maintenance. Dimensions: 3.5 in. x 5.5 in. The Solar Hanging Fairy Light Lantern is a flexible wonder. Its clip-based hanging mechanism leaves you with many options for mounting it. You can: 1) clip it onto a string of lights or another thin area (onto a wire or thin metal, perhaps), 2) hang it as you would any of the other lights with the wire loop, such as onto a hook and 3) the square base allows the Solar Hanging Fairy Light Lantern to sit comfortably on any flat surface. This lantern also will stay on for a long, long time. Its estimated run time on a full battery is up to 10 hours. That is in part because the delicate fairy lights. They efficiently give off bright, but low-energy consuming light. We also love the aesthetic of this light. Although its overall size is small, the little fairy lights that populate the inside of the glass box which makes up the body of the lantern call attention because of their dainty brightness. They don’t seem powerful. But working together, they can light up a space, each lantern giving off in total 7 lumens. Reviewers were pleased with the brightness of the Solar Hanging Fairy Light Lantern. They noted that in total, the set of two lights can light up an area of about 10 ft. They also were happy with the temperature of the light. Its extra warm light glow is romantic and pleasant. The only gripe that reviewers had with the lantern is that it is quite small. Measuring just 3.5 inches in width and with a height of 5.5 inches, including the hanging mechanism, these lanterns are as small as the fairy lights within them are dainty. So in comparison to other lanterns, this one is quite small. As much as we love the Solar Hanging Fairy Light Lantern, there are a few things to keep in mind. As reviewers mentioned, the first is the size. If you’re looking for something to call lots of attention to dominate a space, this might not be the best lantern. That said, the fairy lights do give off more light than one would think. They can light up a small area, so we wouldn’t write them off because of their size. Another thing to keep in mind is how waterproof/weatherproof this lantern is. With an IP rating of 44, this lantern is certified to hold up against splashes from any direction. It is protected from any solid object greater than 1 mm entering it. That means that the Solar Hanging Fairy Light Lantern does quite well against water. However, it isn’t completely waterproof. Despite these considerations, this lantern is a solid choice. It can be counted on to do what it needs to. If the fairy light aesthetic is for you, this is an excellent choice. If not, there are lots of other designs. Dimensions: 3.5 in. x 8.8 in. LivEditor’s Solar Lantern with Candle is the best of both worlds. It combines the best features of the Outdoor Black Candle Lantern and the Solar Hanging Fairy Light Lantern. As a result, it produces a solid hanging solar light. Better yet, it comes in a 4-pack instead of a 2-pack. 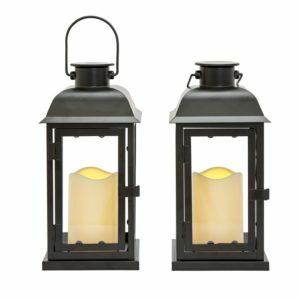 Therefore, you get double the lanterns at a similar price point to many of the other options. In terms of shape, the LivEditor Solar Lantern with Candle has a similar square shape to the Solar Hanging Fairy light. However, it appears slightly slimmer. It also features a small candle inside of the box, similar to that of the Outdoor Black Candle Lantern. The size is intermediate, coming in at 3.5 inches by 8.8 inches. What we really love, though is the long run time. These lights, on a full change, should last around 10-12 hours. So if you place them right, you should be able to get a whole night of light out of them. They’re also easy to hang, so getting them into a good place should be a breeze. In general, reviewers love the functionality of the lights. They say that they work well and consistently. However, they are not particularly bright (nor are they particularly dim – just average). In the experience of reviewers, the lights stay on through rain. They don’t seem to get any damage related to weather. Reviewers note the quality material that this lantern is made of as the likely reason behind this. The only thing that seemed a bit odd to reviewers is that the light for the “candle” comes from above, not inside the “candle” itself. That said, most acknowledged that, especially from far away, the light looks fairly authentic and that they generally do not notice that design. This light is certified waterproof and dustproof, rated as IP 55, which means that it is protected against dust and jets of water from all directions. Short of dunking the light into a pool or a puddle, it will have no trouble. It’s important to consider how to hang this light, and luckily, like the Solar Hanging Fairy Light Lantern, it’s a pretty easy task. Equipped with both hooks and a metal loop to make hanging a breeze, you can also simply place this lantern on a flat surface and the solid square base will keep it pleasantly in place. One thing that some people may not like is the glow of this particular “candle.” Rather than a perhaps more traditional yellow hue associated with candles, it gives off a distinctly “fiery” orange. Although not actually on fire, the orange glow can be a little bit strange. Dimensions: 5 in. x 11 in. For a Hanging Solar Light with a moderate price tag and simple, but effective design, the Hanging Solar-Powered Edison Light is our go-to. The light features a caged “Edison” style light bulb powered by a solar-charged battery. We love the size of this particular light. The bulb is big enough that it distributes the light well and the cage protects the bulb. At the same time, it also is convenient enough to bring along with you camping or on a picnic, or to just hang in a backyard, without stealing all the attention from the space. It comes in a 2-pack and the two bulbs should be enough to light up a small area. Each bulb gives off 5 lumens, which is about normal for a decorative light that has some functionality features. Reviewers highlight the simple, stylish design of these lights and note that the reasonable price point convinced them to buy more than they might have bought if each light were at a higher price point. They especially loved combining many of the simple lights together to create a chain of the lights. In addition to the style, reviewers also expressed being pleased with the brightness. In general, they described the lights as slightly brighter than what a normal decorative light would be, although not quite enough to be the only light unless grouped together. The one big frustration of reviewers was run time. This hanging solar light tends to not last as long as than other options out there. This hanging solar light has an IP rating of 44 in terms of waterproof-ness and dustproof-ness, meaning that it won’t have any issues in normal weather conditions, but if there is a more extreme weather event, it should probably be taken down, otherwise it may not last through it. The advantage is that since it is so light and easy to hang, these lights are easy to move. As previously mentioned, the run time of these lights is a little less than ideal – the average is around 4 hours, which is much less than the 8-12 hours that other lights boast. That said, for a much lower price point, depending on the situations in which you might use the lights, 4 hours may be more than enough. What we do love about these lights and want to highlight again is their simple style and convenient size. The “Edison” bulb is trendy, but also efficient, and overall these lights are an excellent mid-range option. Dimensions: 5.2 in. x 2.4 in. For shoppers on a budget that still want to hop on the solar bandwagon without breaking the bank, the GIGALUMI Cracked Globe Hanging Solar Light is a good choice. You get a lot of bang for your buck, with this 4-pack being the cheapest option on our list, while still getting to enjoy the luxury and environmental-friendliness of solar lights. The GIGALUMI Cracked Globe Hanging Solar Lights look a little bit like they belong on a Christmas tree – they give off a bright white light from inside of a grey-transparent “cracked” glass orb. Please note that the glass isn’t actually cracked, that is GIGALUMI’s way of describing the patterned glass that throws interesting shadows when the lights are turned on. These hanging solar lights are easy to use and simple. They have an “on” switch beneath the top, which once activated, automatically turns on the lights at dusk and, if they haven’t run out of energy by dawn, turns them off at dawn. Reviewers actually say that this product beat their expectations. Many purchased the lights because of their low price point, and then were more impressed when they received the product. They note that the light is tougher than it looks in the photos. The glass is actually quite thick and the overall light heavy, but they are more aesthetically pleasing in real life than in the photos; the “cracked” nature of the glass is more subtle. This particular hanging solar light isn’t for everyone, though. Some reviewers found the lights to be too tacky and Christmas-y, while others just found the light in and of itself too white for what they were hoping for in an ambient light. The lights come in at just 5.2 inches by 2.4 inches, including the hanging mechanism and the plastic border of the solar panel, making them among the smallest lights on this list. That doesn’t mean that they don’t pack some features into the small size, though. These lights are rated at IP 44 in terms of waterproof-ness and dustproof-ness, which means that they are resistant to splashes of water from all sides. They are also protected from particles larger than 1 mm. These small orb-shaped lights are somewhat reminiscent of holiday lights, but at their lower price point and reliable functionality, they make the odd shape worth it. As reviewers mentioned, the “cracked” glass is much less severe in real life, so don’t let the unique design scare you off. Dimensions: 5.5 in. x 13 in. Today, vintage is all the rage, in fashion, in furniture and even in outdoor home décor. The Vintage Solar-Powered Candle Lantern is sure to fulfill your desire to deck out your background like a street from an old romantic movie, if you want to dress it up for a Halloween surprise or just add a touch of retro to your space. It comes in a two-pack and features a realistic flame inside of the rectangular lantern space. The glass is clouded and the light flickers to give the illusion of a dancing flame. The black color option also comes with artful aging to make the vintage look go beyond the flame. The corners and sides feature tastefully “chipped” paint which gives it the most authentic feel possible. Many reviewers actually loved the “flame” inside the lantern, saying that they thought it looked real, both up close and from afar. They also expressed being pleased with the vintage appearance, noting that it looks authentic. One thing reviewers didn’t love with this particular lantern is its run time. Although it is advertised to stay on for 5-8 hours, many said that the maximum that they were able to get out of one charge was 5 or 6, even after refreshing the batteries. Compared to many of the other lanterns and various hanging solar lights on this list, the Vintage Solar-Powered Candle Lantern is quite large. It measures 13 inches in height and each side is 5.5 inches wide. Although this measurement includes the hanging mechanism, it means that it’s quite large (and would look great on a shepherd’s hook). Another thing to keep in mind with regard to this lantern is that it’s not very bright. Considering that it imitates a small flame, the brightness that this lantern gives off is about on-par with a small flame, meaning not much. Although the flame is dim, it certainly is authentic, which is what we love about this vintage lantern. It is a perfect finishing touch for any vintage-style space and given its large size is an excellent decorative piece to have. Dimensions: 2.8 in. x 5.7 in. We’ve given the Mason Jar Solar Lanterns a unique name because they are unique lights, mixing a DIY vibe with the benefits of solar energy. The final product is a cute little light that looks like it belongs in your favorite coffee shop or café. They’re a little bit hippy and very efficient, just like a cute coffee shop, so we’ve declared them the best hanging solar lights that belong in a coffee shop. The modified mason jar top can actually be screwed onto any mason-like jar and utilizes the same seal that a normal mason jar would. You know how when you flip over a mason jar with a tightly-screwed-on top, nothing spills out? This solar lantern uses that same seal, but in this case, instead of keeping the liquid in, it keeps the liquid out. We were a little disappointed that the seller just provides the tricked-out lids, complete with the solar panel for charging, as well as the string of fairy lights for the inside of the jar, which means that you need to provide your own mason jar. It’s not ideal, but given how well the product works, we like it anyway. What reviewers also love is the design. It’s cute, it’s unique and it’s useful, which is just about impossible to beat. They’ve put it on their decks, outside their own restaurants or even just as an external decoration, and have been extremely pleased with the results. Like us, they were often disappointed about needing to provide their own jars, but some weren’t too let down, noting that it keeps the price down and it makes it possible to buy a look-alike mason jar for less money to keep the price of the entire final product down. 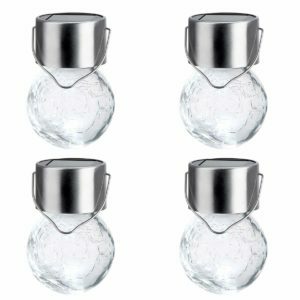 Keeping in mind that the jar must be purchased separately, this product is quite low-maintenance. Once you have your jar, all there is to setup is screwing it on and then hanging the lantern, which has a half-moon wire handle, which makes it easy to mount. This hanging solar light also has an excellent run time. Once the batteries for the fairy lights are fully charged, you can expect them to stay on for about 10-12 hours, one of the longest run times out there for a similar solar lantern. 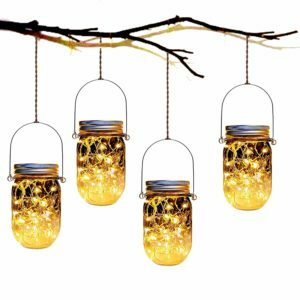 All in all, if you have a few extra mason jars around or don’t mind purchasing a few, these lights, which come in a four-pack, are a great way to add a relaxed feeling to your space. You’ll be sure to feel as if you were in a cozy coffee shop sitting under them. Dimensions: 2.0 in. x 6.7 in. If you’ve gone through this list and thought, “These lights are all really beautiful, but where’s the color?”, we have the set of lights for you. The Beinhome Multi Color Hanging Solar Lights are transparent and come with an LED that changes colors between red, yellow, green, purple and turquoise. You’ll never get bored by the constant changes. The lights are also a great value – the price for a package of four lights is what most other lights cost for a package of two, and the Beinhome Multi Color Hanging Solar Lights are almost like five-in-one each because of the colors that they rotate through. As expected, reviewers love the color changing nature of the lights – that’s the reason most of them bought the lights, and that’s the reason that most of them enjoy the lights. They also say for the number of lights that the pack comes with, at their low price point, they are a good deal. One thing reviewers weren’t thrilled about was the size of the orbs. Most said that the lights were smaller than they expected. Reviewers also noted that, as fun as the color changes are, the actual light that they give off is not particularly bright. These lights are more suited for decorative use or to call attention to a place rather than for trying to light up a space. The thing that distinguishes these hanging solar lights from other options is their colorfulness. Unfortunately, the color changing is automatic, so you cannot control which color an orb is at any given time. They consistently change between red, yellow, green, purple and turquoise, making for a light show every night. Keeping in mind that these orbs are quite small is important, as well, because although this package comes with 4 lights, they are 4 relatively small lights that are not very bright, so it might be necessary to have more to fill a space. Luckily, they come at a good value, so you can easily purchase many. Dimensions: 8.9 in. x 6.1 in. x 4.3 in. 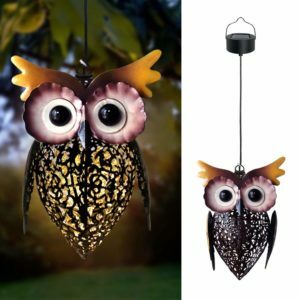 Those solar fanatics that like to stay up all night might identify with the Hanging Owl Lantern. It’s a 9-inch-tall solar-powered, glowing metal owl, hanging on a wire, ready to be placed in any tree to give a space a little bit more life. Despite its relatively small size, the Hanging Owl Lantern is hard to miss. Although there are many different solar character or object-shaped lights, we included the Hanging Owl Lantern because in addition to being cute and fun decoration, it has an excellent run time. In the summer when the batteries are able to reach their maximum charge consistently, the Hanging Owl Lantern should stay on for about 10 hours, so anyone looking to get light all night will be pleased with the owl. The reviewers that purchased the owl love it. They note that the colored metal that it is made out of it not only aesthetically pleasing, adding to the overall playful steampunk appearance, but it is also very durable. This owl is notable for its big eyes, but the light from the owl actually comes from within it. Reviewers love the shadows that the light throws from the body design of the owl, but they were consistently disappointed that the owl’s light isn’t any brighter. The reasons that we love the owl are its run time and durability. You can expect it to stay on for 10 hours during the night in the summer, perfect for any night owl. It also has an IP rating of 55, meaning that it is able to withstand almost any storm that it might get caught in, thanks to the seal around the solar panel and the strong metal of the owl. Where it is somewhat lacking is in brightness. Compared to other lamp options meant to light up an area, the Hanging Owl Lantern is not the strongest, but it is more than enough for a decorative light. If you can fine a place for the owl to fit into your yard décor, you will not be disappointed with its performance. Its cute design is the perfect finishing touch. Dimensions: 2-in. bulbs, 20-in. apart on a strand of 27 ft. String lights are a must-have for any outdoor space. New and hip bars and restaurants often feature them, as well as classic outdoor seating in a café and funky breweries. They’re great for actually lighting up a space in an attractive way. This particularly string of lights comes with 12 2-inch bulbs that are placed 20 inches apart on a 27-foot strand. The design is excellent for either layering them side-by-side to get maximum brightness or stringing them out to take advantage of the long strand to cover as much ground as possible. Reviewers raved about these particular string lights, noting that their simple design makes them flexible and useful in almost any setting. 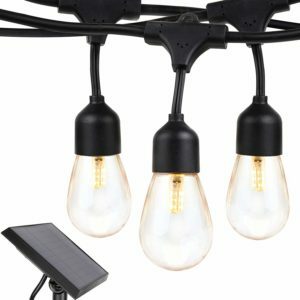 The classic “Edison” style bulbs are very fashionable right now, meaning that the Brightech Solar String Lights were exactly the right piece for many people’s various outdoor spaces. According to reviewers, they are easy to hang. Some twirled them around their deck’s railing, while others stapled them to siding, and some reviewers even hung theirs between their house and a neighbor’s house. They said that in any of these various places, the lights are exactly as bright as they were hoping they would be. Compared to other hanging solar lights, string lights can be a bit more complicated to hang, perhaps requiring more outside parts, but this model is well-spaced-out and designed with hanging in mind, making the process as painless as possible. One thing to have in mind with Brightech’s Solar String Lights is that they do have a shorter run time than many of the lantern and orb-type lights, lasting a maximum of 5-6 hours. This might be a pain for those hoping to use them as an all-night decorative light, but most find it’s a worthy trade-off, given how bright the lights are. We’ll be honest – we love lanterns. The aesthetic is our favorite; it’s classy and simple, but also practical to hang and you can expect a decent amount of light from a lantern without it being overwhelming. That said, though, there is a lot of variety in solar lanterns out there, and even more variety when you consider the entire category of hanging solar lights. The vast majority of hanging solar lights exist more for decorative and aesthetic purposes, which means that keeping in mind the diversity of forms and designs is important. We’ve broken down our list into what we find to be the main types of hanging solar lights, leaving you with a list of the different categories and the best uses for each category below. By far our largest and favorite category, lanterns are a simple hanging solar light that consists of a main central light (which can come in a variety of forms: it can be a bunch of fairy lights, an artificial candle or just a simple light bulb) inside either a rectangular or circular box. These lights generally have a simple hanging mechanism of either clips or a half-moon wire handle, that make for an overall easy-to use, no fuss hanging solar light option. Lanterns are the most versatile of the types of hanging lights – they look as great as a centerpiece on a table as they do hanging on a deck and everywhere in between. We recommend that, when in doubt, you go with a lantern because you will definitely find a use for it. Appearing perhaps more holiday- or theme-oriented, orb-shaped lights tend to have a standard design of a sphere with a metal or plastic mount for a solar panel which is then attached to the hanging mechanism. Orbs tend to come with some sort of design on the sphere, perhaps colors or a specific shape of glass which casts distinct shadows. So, although not all were hanging solar lamps, if you have a use for an animal- or object-shaped solar light, there are many options out there. Most work just as well as other solar lights, just with a slight design twist. When considering the best hanging solar lights, we asked ourselves the features that are necessary for a hanging solar light to have and the features might we like a hanging solar light to have. 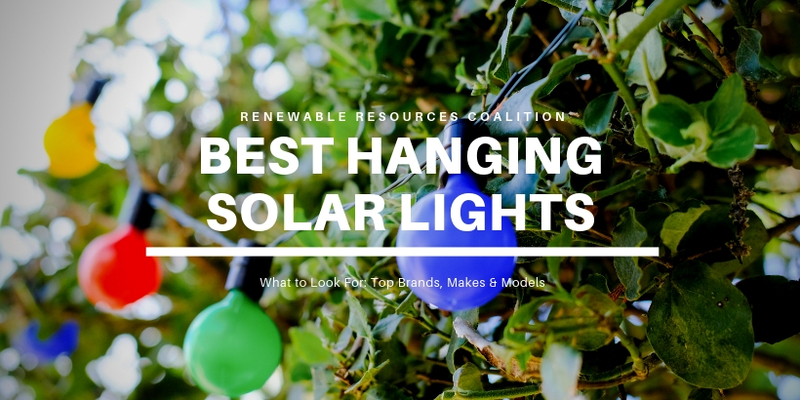 Of course, there are many different uses for hanging solar lights, so we ranked the lights on our list based on overall “bests” and bests for different uses. What all of those products have in common is a certain level of quality and what they don’t have in common are certain specific features. All of them have efficient solar panels attached to a battery, so that during the day your solar light will charge up, and then at night, they automatically come on (that is because they all have a system that automatically turns them on when they detect darkness and automatically turns them off when they detect light). They also all include some sort of built-in hanging mechanism to make installation quick and easy. Size is important for a few reasons. The first is that since these are hanging solar lights, they cannot be too large or too heavy or else they will not hang well. One the other hand, they should be big enough that they make sense to hang. It’s also important to know how big they are before purchasing them. That way you can think about what you have in mind for a space and consider whether or not to buy a light based on whether it will fit well into the space. 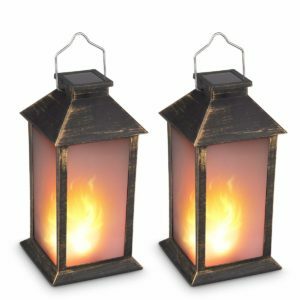 Outdoor Black Solar Candle Lanterns 5.5 in. x 11.5 in. 2.2 lbs. Solar Hanging Fairy Light Lantern 3.5 in. x 5.5 in. 7 oz. LivEditor Solar Lantern with Candle 3.5 in. x 8.8 in. 1.1 lbs. Hanging Solar Powered Edison Light 5 in. x 11 in. 1.4 lbs. GIGALUMI Cracked Globe Hanging Solar Light 5.2 in. x 2.4 in. 1.6 lbs. Vintage Solar Powered Candle Lantern 5.5 in. x 13 in. 3.2 lbs. Mason Jar Solar Lanterns 2.8 in. x 5.7 in. 2.9 lbs. Beinhome Multi Color Hanging Solar Lights 2.0 in. x 6.7 in. 14 oz. Hanging Owl Lantern 8.9 in. x 6.1 in. x 4.3 in. 10 oz. 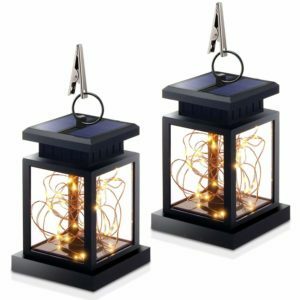 Brightech Solar String Lights 2-in. bulbs; 20 in. apart on a strand of 27 ft. 4.6 lbs. One of the most important factors to us is run time, meaning how long the lights can be expected to stay on, given a full charge. This is especially important if you plan on using the lights during the winter when the sun goes down early or you would like them to be on all night. Run times are estimated, based on ideal conditions, but they can serve as a good comparative indicator as to which lights will stay on longer, even in less than ideal conditions. In either case, longer run times are better. The vast majority of the hanging solar lights that we came across fell into the category of “warm white” with regard to the temperature of the lamps, which is generally desirable for decorative or ambient lamps. The few outliers mostly come in some of the variations of the lamps, but it’s important to keep the temperature in mind if you’re looking to use the light in a very specific place. *When the manufacturer did not provide the exact color temperature, we will mention the “category” of color temperature, with warm white falling between 2000K and 3000K and cool white falling between 3100K and 4500K. **The Vintage Solar-Powered Candle Lantern was the only light for which the manufacturer did not provide either a color temperature or the category under which the color temperature falls. Do lights without listed lumens be really dim? What does the temperature of the light mean? How can I hang up my hanging solar light? Part of the hanging mechanism is blocking the solar panel from getting full light. Will that affect the charge of my light? What if my light doesn’t get fully charged during the day? Not all of the items in the list have the lumens listed. Why is that? Does that mean that the lights that don’t list the lumens will be really dim? Definitely not. In many cases of decorative lights, manufacturers don’t advertise the lumens of their lights, because small decorative lights almost always fall between 5-10 lumens, as the small, less-powerful bulbs can’t give off much more than that. That said, all of the lights on our list are bright enough to be pleasant and seen, but they are not bright enough to serve as a security light, nor should they be relied on as a singular source of light in the darkest time of the night, rather they should be used for decorative purposes. The temperature of lights are measured in Kelvins, although it (thankfully) doesn’t measure the actual temperature of the light bulb. Instead, the temperature is determined on the basis of Correlated Color Temperature (CTC), which, in short, correlates the color of the glow of a light with the temperature to which a piece of metal would need to be heated to achieve that same color. Lower temperatures correlate with warmer colors (in the order of red, orange, yellow), and higher temperatures with cooler colors (yellow, white, blues). These temperatures tell us more or less how the “feel” of the light will be, either warm or cool. The lights on our list feature a few different hanging mechanisms. One is what we call a “half-moon wire handle,” which is really fancier than it sounds. All it means is that the lights are topped off with a metal wire designed in a half-moon shape to sustain the lights. These lights are prefect for hanging on a shepherd’s hook. They also often can sit on their own, so it’s not necessarily key to have a place to hang them and they are generally easy to put up and easy to take down. Another possible hanging mechanism is clips, which are actually often connected to a half-moon wire handle. These clips are generally small and usually require that you hang the light onto another wire or cord. Lights with clips also usually can sit on their own or be hung in the same way as a half-moon wire handle without utilizing the clips. The final hanging mechanism that is found on our list is that of string lights. String lights can be a little tricky because you often need staples or hooks to hang them, in a similar way that one might hang holiday lights, but if you have those materials, they are super flexible. Unfortunately, the way that many hanging solar lights are designed, the hanging mechanism can block some sunlight. One way to combat this is to ensure that the place where you’ve hung your hanging solar light does not block the sides of the light. The sun is directly centered in the sky for only a few hours a day, so as long as the sides of the light are exposed, thus exposing the solar panel to other sun angles, the light should still charge. If your light isn’t able to be fully charged, due to short winter days or cloudy weather, then it may not last the full advertised “run time.” Most of the batteries for the hanging solar lights on our list need a full 8 hours of sunlight to be fully charged, so if they don’t get those full 8 hours, then the batteries won’t work as long as they would otherwise. This translates to the same outcome as any other battery that you regularly interact with, like your phone battery: less charge means less time lit up. Samantha is a writer and translator interested in how people can make their lives greener. 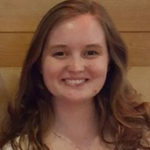 She has studied conservation, sustainability and development, and in the past has worked as a teacher in Argentina and in a variety of nonprofits around the US. We at RenewableResourcesCoalition.org work to publish a thorough & editorially independent website covering a range of environmental & alternative energy topics. RenewableResourcesCoalition.org participates in the Amazon Services LLC Associates Program. From time-to-time, we may recommend a product for you to purchase for a specific purpose - and will often link to Amazon's website for you to easily complete that purchase. If you buy a product at Amazon after clicking one of our links, we may earn a commission.